Arduino is on a mission to make technology accessible to everyone, and into the hands of every student and educator. To make this possible, we have created Arduino Education: a dedicated global team formed by education experts, content developers, engineers, and interaction designers. 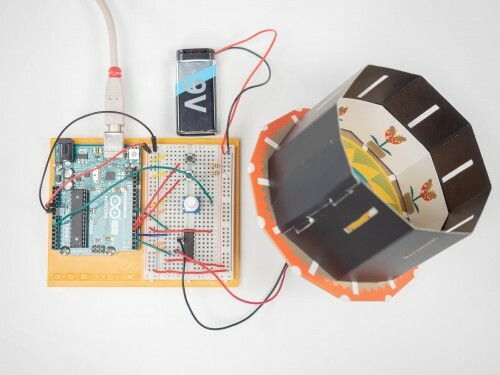 Arduino Education is focused on creating the next generation of STEAM programs — integrating Science, Technology, Engineering, Arts and Math — while supporting the needs of teachers and students throughout the educational journey. Educational institutions use Arduino as a resource to assist in educating their students on a wide variety of topics, using several methods. Develop: Arduino is widely adopted at post-secondary education (e.g., universities, colleges, research institutes) in the fields of engineering, Internet of Things, robotics, art, and design. Teach and Learn: Many secondary schools use Arduino in innovative programs for cross-curriculum studies. Play: Primary schools use toys embedded with Arduino technology to introduce physical learning, logic, building skills, and problem solving. Arduino Education offers solutions for the classroom, kits, bundles and boards with learning paths for individual and collaborative educational approaches. Learners explore Arduino in a hands-on, constructive way as they work through the kits and explore the creative capabilities of each board. 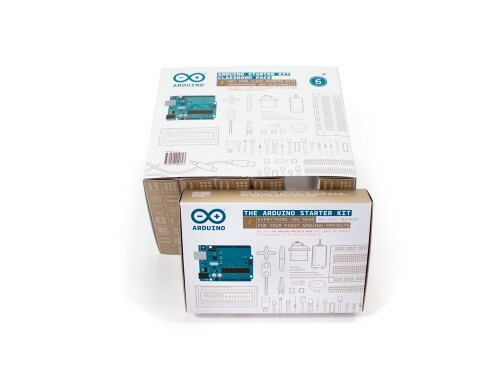 Whether you’re a teacher new to electronics and wanting to introduce physical computing and computational thinking to your lesson plan, a university professor skilled in electronics, or a postgraduate researcher, we have an Arduino kit or board perfect for you. Take a look at our catalogue and choose what best suits your needs. The ideal package for a class that introduces programming and electronics through fun and engaging interactive projects. Creative Technologies in the Classroom 101 is the flagship Arduino educational program for schools. Arduino CTC 101 is a modular STEAM program consisting of a toolbox with 26 projects and easy-to-assemble experiments, an online platform, and guided training/support for educators. The program, tailored for ages 13 to 17, has 5 themed modules and introduces students to the foundations of programming and basic coding, Arduino boards and digital signals, analog signals and serial communication, robotics, power systems, motors, wireless communication via Bluetooth and advanced sensors. CTC is one of our best educational activities and makes us especially proud on account of its potential for teacher training, student motivation, and transformation of the society in which we live. It was new, interesting and educational. The students appreciated Arduino, and the interest is wide among students and teachers alike. CTC It's a great way to get started with programming, electronics, and automation — this program is so entertaining and fun that it does not seem like you're taking a class — all classes should be as interactive and constructive just like these! Featuring state of the art hands-on incorporation of Arduino technology in an educational setting, students will learn fundamental engineering concepts, key aspects of mechatronics, and MATLAB and Simulink programming. 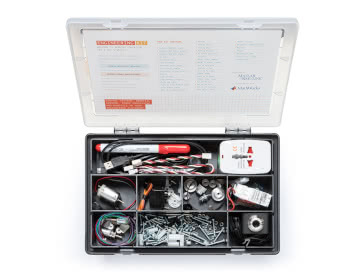 Teach your students about system modeling, controls, robotics, mechatronics, and other important engineering concepts with the new Arduino Engineering Kit. 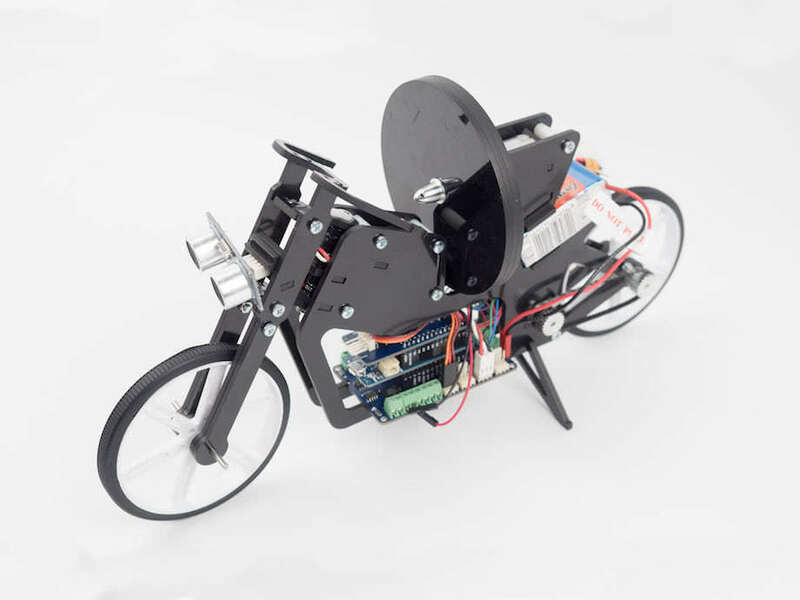 The kit – based on MATLAB and Simulink – includes an Arduino MKR1000, custom designed shields, and all the other components necessary for building projects that are sure to engage your students: a self-balancing motorcycle, mobile rover, and drawing robot. 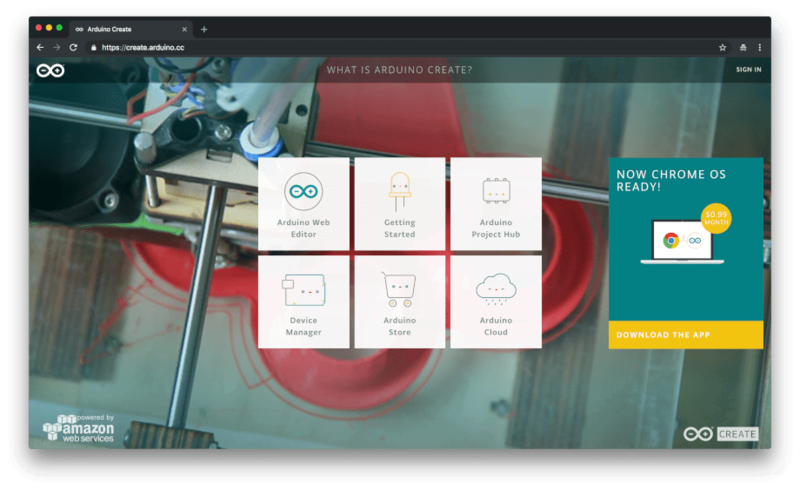 Arduino Create is an integrated online platform that enables developers to write code, access content, configure boards, and share projects. Go from an idea to a finished IoT project quicker than ever before with an IDE, remote device management and other cloud services — all accessible within an environment that’s easy for beginners, and productive for professional developers. Arduino Create Project Hub is a community dedicated to discovering how fun and rewarding tinkering with electronics and software can be. Any project made with Arduino boards is welcome! 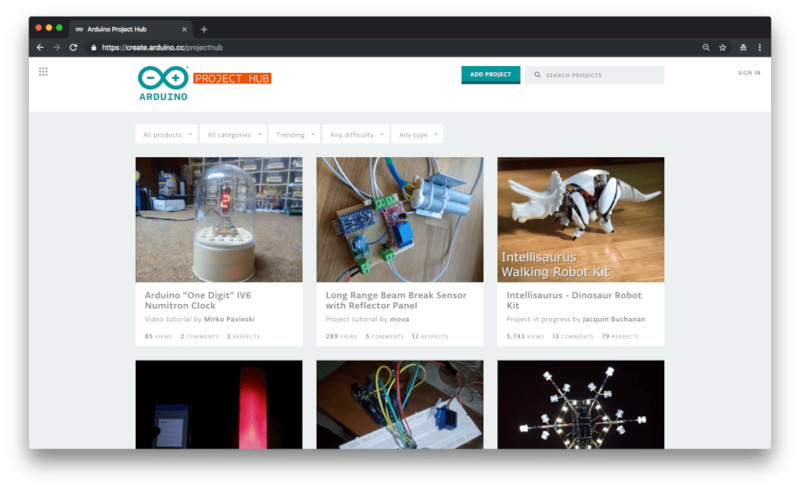 Arduino Project Hub is also a great place to keep your projects and easily share them with your friends, students and the community! 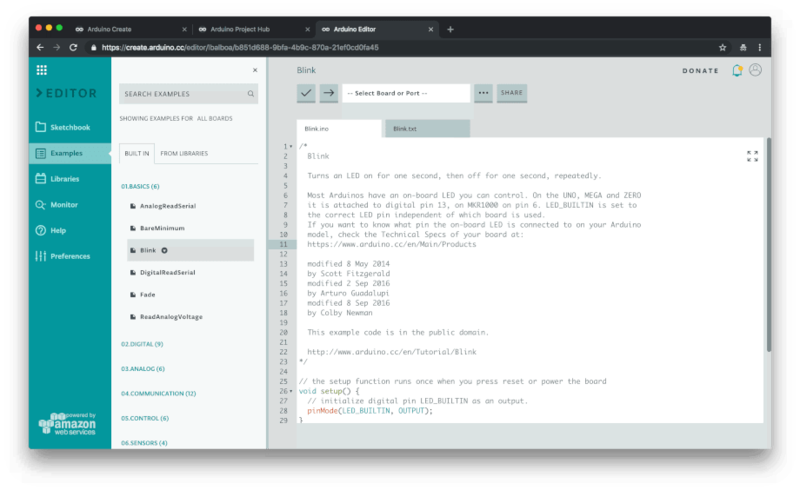 Arduino Create Web Editor allows you to write code and upload sketches to any Arduino board after installing a simple plug-in. Your Sketchbook will be stored in the cloud and accessible from any device. You can even import your Sketchbook via a .zip file. Sharing Arduino code is now as easy as sharing a link! We will also be launching new features to let teachers manage a whole classroom of students, accessing their sketches, to allow a new collaborative way of working online. 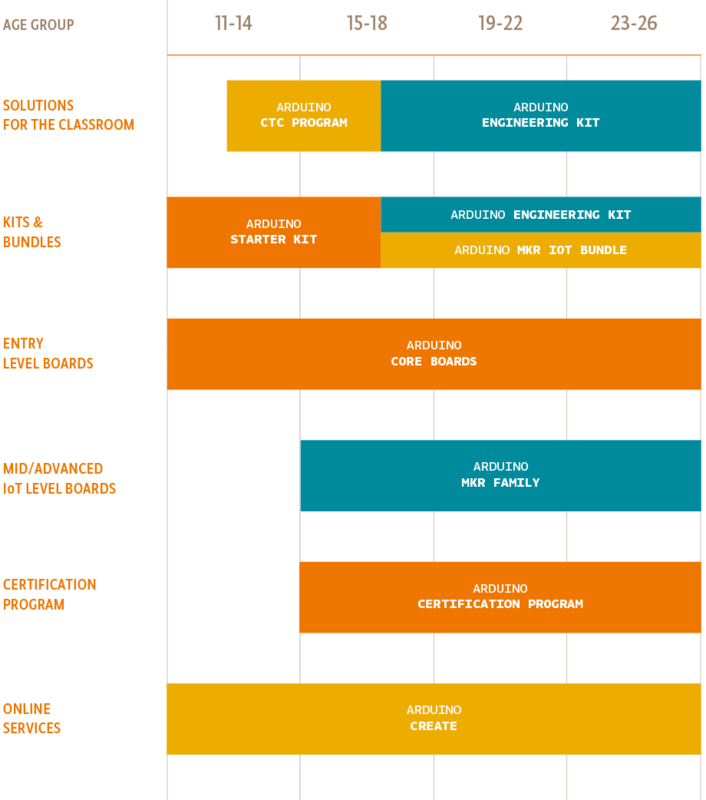 The Arduino Certification Program (ACP) is a structured way to develop your professional skills and get official recognition as you progress. 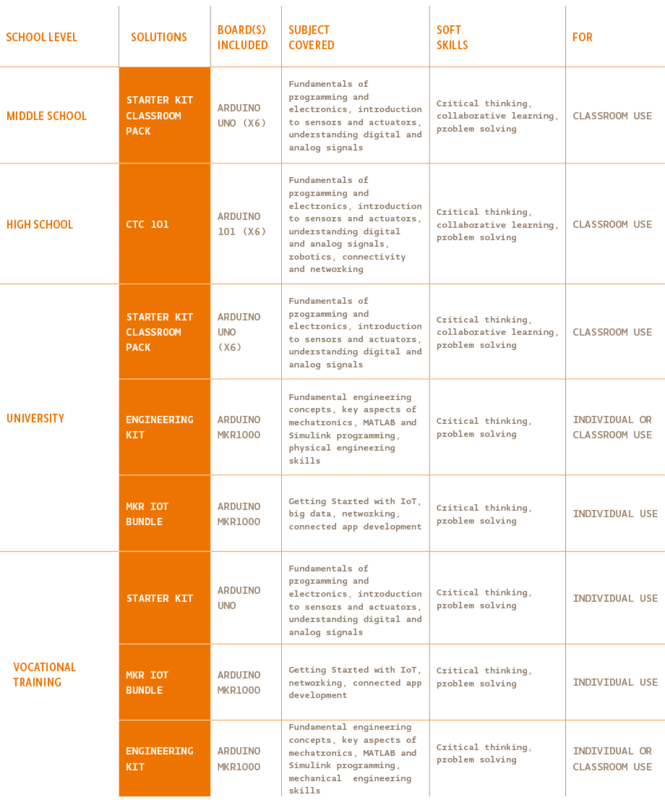 It includes online courses and webinars, certification exams, and certificates of achievement. Arduino Fundamentals (Early 2019) The basic course for Arduino enthusiasts is an online course based on the Starter Kit. Arduino Fundamentals will become available soon and more will follow during 2019. Arduino for Educators (Coming Soon) Designed for professional educators, the basic course covers the fundamentals of technology (i.e., theory and practice of electronics) and pedagogical modules (i.e., techniques to teach physical computing, electronics, and prototyping). Arduino for Professionals (Coming Soon) For those using Arduino for business, the basic professional development course is divided into three different tracks: engineering, art & design, and applied science. Do you want to get started with Arduino? Looking for free resources for your classroom? Ready to buy an Arduino Education product for your classroom? Do you want to get in touch with the Arduino Educators Community?